Fig. 1. 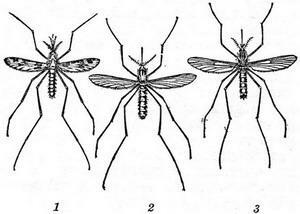 Mosquitoes (females): 1 - malaria (Anopheles); 2 and 3 - nemaline (2 - Culex, 3 - Aedes). Fig. 2. 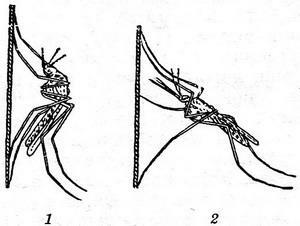 Methods of planting mosquitoes on a vertical surface: 1 - pmalering; 2 - malarial. Mosquitoes are insects of the family Culicidae (camaroontree), order Diptera. To the family Culicidae the large number of genera, uniting as blood-sucking, and not blood species of mosquitoes. Mosquitoes (Fig. 1 and 2) are divided into malaria (of the genus Anopheles) and nenalezeny (genera Aedes, Culex, Mansonia, Culiseta and others). Malaria mosquitoes (in the USSR 9 species) is a specific carriers of malaria parasites. Nemaline mosquitoes (in the USSR 73 species) can carry pathogens more than 50 viral and bacterial infections and parasitic infestations, including tularemia, Japanese encephalitis B, yellow fever, dengue fever, of Filaretov and other Nemaline mosquitoes are widely spread on the territory of the Soviet Union, often accounting for the bulk of midges (see). Species of the genus Aedes especially numerous in the North and in the middle zone, the species of the genus Culex - mainly in the South. Culicidae pipiens molestus have adapted to life in the cities. Male mosquitoes feed on only free liquids, females - blood humans or animals (for the development of sexual products). In places the emergence of mosquitoes are natural and artificial reservoirs. The development cycle of the mosquito consists of eggs, larvae, which runs four instars and pupae and adult insects (beetles). Measures to combat mosquitoes are the destruction or reduction in breeding sites, the destruction of larvae in the ponds, adults in premises and in nature (see Disinsection). Fronts of struggle and its intensity depends on the natural and socio-economic conditions. The destruction in breeding sites is carried out in the course of large and small hydro-technical measures. Larvae destroy, wetting the surface reservoirs of oil (40 - 60 g/mg) or its products (in the processing of reservoirs for water birds and fish-breeding reservoirs of oil is not used). Widely used for spraying persistent preparations Farrukh Dustov and liquids - DDT (56 g/ha), dieldrin (112 g/ha), lindane (112 g/ha), chlordane (112 g/ha), Malathion (225 g/ha) and fenthion (30 g/ha). In the southern areas is very effective settling ponds fish by Gambusiathat eat mosquito larvae. For the extermination of adult insects use persistent drugs residual effect in the form of aerosols (best), emulsions, suspensions or powders - DDT (2 g pure substance per 1 m2), lindane (0.5 g/m2), Malathion (2 g/m2), dieldrin (0.6 g/m2); handle them one or two times per season economic and accommodations, vegetation, which keep mosquitoes: Individual mechanical protection against mosquitoes is wearing protivomoroznyh nets, tashetkany premises, the use of nets, as well as in the use of repellents (see). When working with drugs residual effect it is necessary to strictly comply with safety rules. Cm. also Disinsection, Malaria Vectors.